Is the way pomegranates storage done really all that important to the shelf life of the fruit? The short answer is yes, the way you store this fruit can mean all the difference depending on how long you wish to keep fresh, whole fruit or the arils on hand for use. 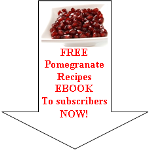 Here are some excellent guidelines on how to store your pomegranates at home. Never leave the fruit in the way of direct sunlight, but rather store it in a place that is darker or shaded. Whole pomegranate fruit that has not been punctured or sliced into will keep in the pantry or on the counter for up to 30 days stored in this manner. You can freeze the arils or seeds to use later for salads, main dishes, juices, syrups, or just snacking. Prepare the arils for freezing by spreading them out on a wax-paper lined sheet or jellyroll pan. Place them into the freezer on the sheet so they can freeze individually. Remove after about 2 hours and then toss them into a plastic freezer bag or a container. You can store arils in the freezer for 6 months to a year! Planning to eat the pomegranate fruit relatively soon, but want it cold? Storing the fruit inside the refrigerator in its whole state will keep it fresh and delicious for nearly 2 months. Extend the longevity of the fruit to a whopping three months by storing it inside a plastic bag in the refrigerator. If you plan to use the arils within three days, go ahead and remove the arils from the membrane and store them inside the refrigerator in a sealed container. Pomegranates that will be kept whole until you’re ready to use them should be free of any noticeable bruising, cuts, or blemishes on the skin of the fruit. Make sure the fruit appears fresh and has good color – a deep purplish-red color or a yellowish-orange color. The skin of the fruit should be smooth, not crackled or rough. There are special bags that you can purchase for pomegranates storage if you choose to keep them for an extended period of time in whole fruit form. 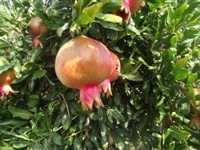 Read enough about pomegranates storage and want to discover more about pomegranate information?